Katie was a research assistant with the START Program from 2011-2013 while completing a dual Masters of Public Administration and Business Administration. 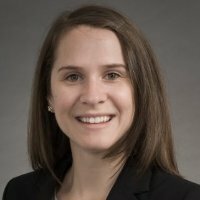 After graduation, Katie began a career in strategy consulting, helping clients work through complex strategic initiatives from visioning and research, through strategy design, planning, and implementation. Katie is currently Strategic Marketing Planner at PATH. I never hesitate to say that START was the highlight of my graduate school experience. As a business student, START took me out of my comfort zone into new topical areas where I was challenged to overlay my understanding of finance, operations, and strategy. Each project was a humbling experience, as I learned from my colleagues and mentors in epidemiology and public health about some of the world’s most complex health challenges and the policies and programs that aim to alleviate them. START was a testing ground for all of us, as we honed tactics in analysis, management, and leadership, and I still refer back to what I learned from my START colleagues.